Few collectors have ridden the book collecting hobby harder or with more enthusiasm than A[lfred]. 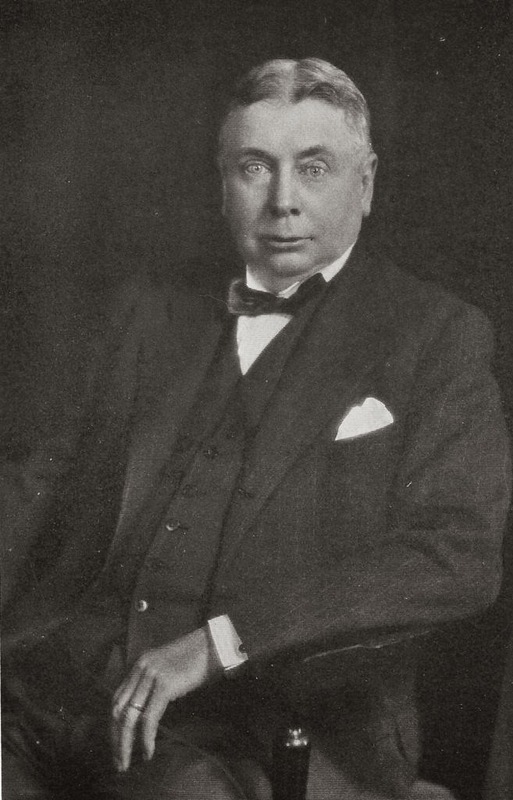 Edward Newton (1864-1940). Indeed, none have been able to infuse into others a virulent contagion for the grand sport like Newton did through his writings. Even now, almost 100 years later, his wide-ranging biblio-essays continue to provide inspiration and entertainment. His first and most famous contribution to bibliophilic literature was The Amenities of Book-Collecting and Kindred Affections (1918). 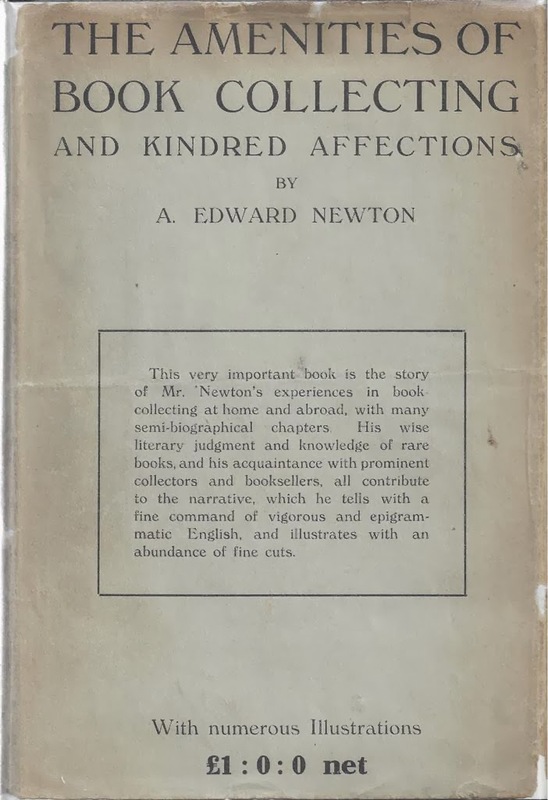 This diverse collection of essays reflects Newton as a man and as a collector. The book would go through eight printings in his lifetime and be honored with a separate edition in the Modern Library series. Newton, a self-made Philadelphia businessman with no formal higher education, started humbly enough working for others until he began his own stationary and fancy goods store. It eventually employed over 100 people. He regularly wrote ad copy for his businesses which helped sharpen his writing skills. Newton took a gamble and bought into the financially troubled Cutter Company, the first producer of the push button switch and the ITE Circuit Breaker. The venture paid off handsomely and eventually brought him comfortable wealth—not Croesus level financing like some of the mighty collectors of his day such as Henry Huntington and Pierpont Morgan—but enough to indulge his book collecting with relish. And A. Edward Newton was off and riding. 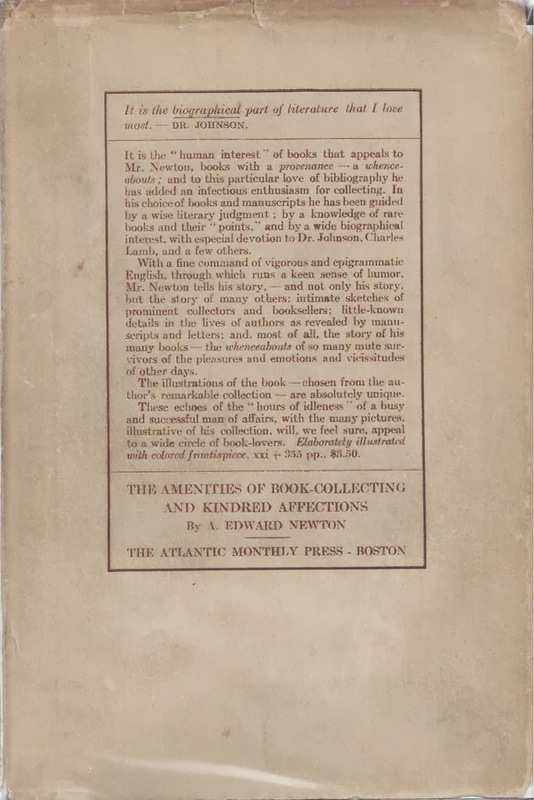 The Atlantic Monthly Press eventually gathered thirteen essays including “Book-Collecting Abroad,” and “Book Collecting at Home,” and published in November 1918 The Amenities of Book-Collecting and Kindred Affections. 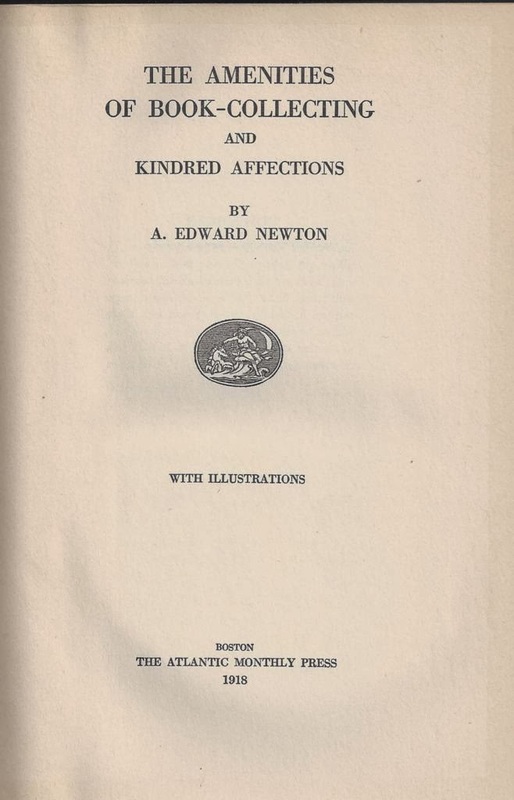 Newton explains in the introduction that the book was not “written by a scholar for the scholar,” but rather “My book is written for the ‘tired business man’ (there are a goodly number of us), who flatters himself that he is fond of reading.” This accessible approach spiked with humor and personal stories resonated with contemporary readers and continue to do so today. The first printing of 4,000 copies sold quickly and a second printing of 5,000 copies followed soon after in March 1919: the continued popularity of the book through the 1920s and 30s necessitating eight total printings totaling some 25,000 copies. The book was also reprinted in the 1960s. Used copies still abound for the current reader. The first third of The Amenities comprises his two original essays cited above along with “Old Catalogues and New Prices,” and “’Association’ Books and First Editions.” These four chapters sparkle with book hunting stories, collecting witticisms and advice, as well as accounts of Newton’s relationships with prominent dealers and collectors--now a glimpse into one of the great book collecting periods. Six additional chapters focus on various historical personalities, many related to Dr. Johnson and Boswell, and draw upon books and letters in Newton’s collection. Two more chapters, “A Great Victorian,” on Anthony Trollope, and “Oscar Wilde,” are remarkably prescient essays championing the genius of two then-neglected writers. Newton’s literary evaluation of Wilde, separating his personal downfall from his work, is uncommonly impressive, especially given the age’s general condemnation of homosexuality and the still contemporary nature of Wilde’s troubles. Newton shows himself to be open-minded and not afraid to tackle a controversial subject when literature was involved. He finishes the book with a fine chapter memorializing his young friend, Harry Widener (1885-1912), destined to be a great book collector, who was unfortunate enough to accompany his family on a return trip from England aboard the Titanic. Widener’s mother survived and built the Widener Library at Harvard to house Harry’s already impressive collection and to honor his memory. The Amenities is heavily illustrated throughout with pertinent examples from Newton’s library that combine text and image into a cohesive whole. The success of The Amenities made Newton a celebrity in the book world. He played the role to the hilt, his outsized personality punctuated by his trademark checkered suits and red bow ties. He corresponded with collectors, dealers, and book lovers--famous and obscure—apparently finding time to compose a letter or note to all. He also wittily inscribed his books in abundance. He gave innumerable talks on books to various organizations. No one had more fun book collecting than Newton. Over the next fifteen years he published four additional collections of biblio-essays mined from the same vein: A Magnificent Farce and Other Diversions of a Book Collector (1921), The Greatest Book in the World and Other Papers (1925), This Book-Collecting Game (1928), and End Papers: Literary Recreations (1933). He also wrote a play, a travel book, and many other miscellaneous jottings. 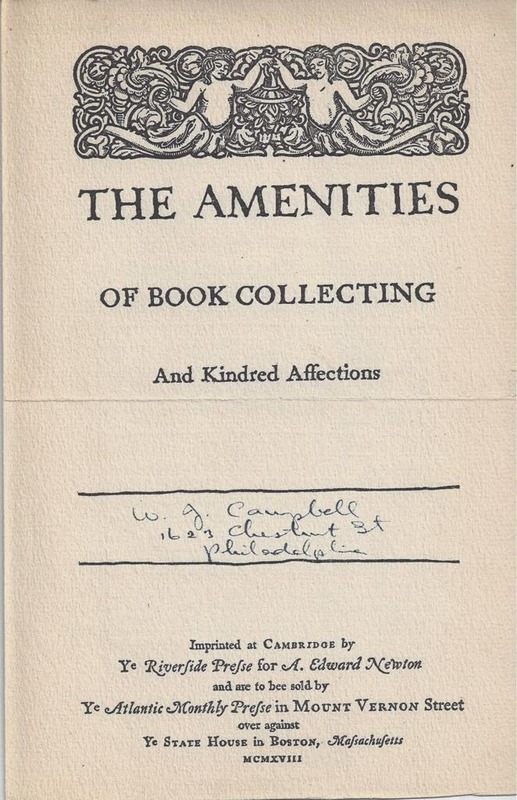 The Amenities of Book-Collecting and Kindred Affections. Boston: The Atlantic Monthly Press, 1918. xxi 355  p. Colored frontis, plates, text illus. 8vo. Quarter cloth and boards, paper spine label, dust jacket. Tipped-in errata slip often found at page 268. The slip refers to Newton mistakenly locating in the text his hotel in Piccadilly instead of Pall Mall. Examples without the errata slip and error uncorrected are also common. However, the errata slip was present in the earliest copies (ie. in my collection his daughter’s copy and the copy inscribed to the publisher both contain the slip.) See the variety of examples with and without slip in Robert Fleck’s bibliography A. Edward Newton: A Collection of His Works. [New Castle, DE]: Oak Knoll Books, Catalogue 86, 1986. The second printing as noted by Fleck corrected the error and reads instead “Pall Mall.” But as is frequent in bibliography all is not cut and dried. I possess an unrecorded variant of the first printing with the error on p. 268 corrected and the slip present. The copy is in the second issue dust jacket (see below). This variant is apparently scarce—I have not encountered another. The first printing has two issues (states?) of the dust jacket. The first issue has no printing on front or back panels, only the title and author on the spine of the jacket. The second issue jacket contains a publisher’s blurb for the book on the front cover. Copies in jacket are now uncommon. Copies in the second issue jacket are in my experience more difficult to find. The first British edition, published in 1920 by John Lane, the Bodley Head, London, was bound from sheets of the second printing of the American edition. Fleck records two binding variants: one with pages uncut except for top edge, the other with all edges trimmed. Copies in jacket are rare. I know of only two, one being illustrated below from an example in my collection. Makes me want to read this book! You can read it online until you pick up a copy. Here's one version in color. Great article, and I love the bibliographic note.